Yesterday I was welcomed back to the work world with a 10 hour day. I definitely think the first day back on the job from being off is the hardest. I had 16 days worth of e-mails, paperwork, missed power points, etc. It made me wish I was still out in vacation world. Oh I miss you! Welcome back to the real world! Hope you survive these first days back! I left when I was 18 and now I want to go back...lol Not sure when that will be possible though. I have been to visit of course but to live there again would be awesome. Sigh... your travels make me want to go somewhere, and SOON! A new adventure... I'm going to Myrtle beach in August, but i've been there before. I want to go to CALIFORNIA! Wahhh waaah! It looked like an amazing trip! We're 2 hours from the beach and it really is great. I can't imagine only 25 min from it. Maybe you'll get the opportunity to go back soon..especially if you're on the west coast anyway! 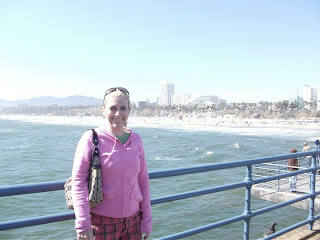 I hear you - I LOVE the California lifestyle! Glad you had a fun trip, even though it made the transition back to work more difficult. Yah coming back to work after a vacation is sucky! IT is always hard going back after a long and relaxing vacation. I am having a hard time getting my husband to take leave b/c he is already dreading what will be waiting on him when he gets back!! Oh my! What a day back from vacation! Sorry it was so long! You're right! That day is the worst! California is a lot of fun! I've only been to San Francisco. It's good to hear NICE things about LA as I only seem to hear about the high crime and stuff like that. And I agree, the first day back is by far the hardest! Glad you had a great time! Going back to the real world is always so tough! I hope you get to go back very very soon! agreed - the first day back is always the worst! Don't worry you'll fall back in to the routine before you know it. Clearly I'm a fan of California too, since even though I don't live there I still consider it home. YOU BETTER COME BACK SOON! You look so cute! Glad you had fun. I can't remember where I came across your blog but I'm happy I found it :) You have a great way of capturing a good picture to tell a story! Cute blog. I really like the header at the top of your page. California LOVED having you!!! :) You should visit San Diego next!!! I am glad you had so much fun! Wow that looks like it was an amazing trip! Ahhh I'm so happy you share my love of California. It really is a wonderful state. I'm glad you had a fun trip, I love the photos! California is pretty much the best place on earth minus the politics and the debt! I'm glad you had fun! Living near the beach is something I long for over here! Maybe I am totally crazy...am I the only one who thought you were moving to New Mexico? I don't know why I thought that. Are you not? 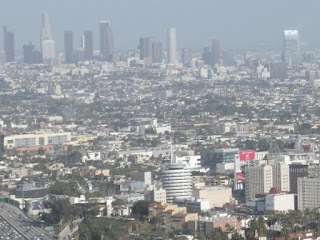 I love LA too, it's soo much fun. Eeeek I totally understand what it's like coming back to work! Hopefully you get caught up quickly. Your pictures look great so far!